The Serengeti: One of the world's wildlife wonders! The Serengeti ecosystem is, in fact, a continuation of Kenya's Masai Mara - the migrating animals are not concerned what we humans call each country! The park also borders the Norongoro Conservation Area to the southeast and the so-called 'western corridor', along which the animals migrate comes withing 8 kilometres of Lake Victoria. 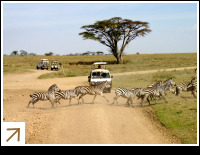 Click here to find out when the best time to see the Great Migration is.